Be met at the exit of the airport by the tour guide, who will hold a paper sign with your name on for you to recognize. Transfer back to hotel to check in. In the morning, visit the historic Tiananmen Square and the majestic imperial palace Forbidden City nearby. Heading to Temple of Heaven, where the empeors worshiped heaven for good harvest. Drop by pearl factory, dinner at Quanjude Roasted Duck Restaurant, Enjoy the Peking Opera. Today, we are heading to Badaling Great Wall, one of the greatest miracles in the world, which winds up and down across mountains, grasslands, deserts and plains of China like a huge dragon. Drive back to downtown to visit Summer palace, a fantastic royal garden to admire the peaceful landscape and magnificent architecture. Drop by silk factory, have a exterior visit to Bird’s Nest and Water Cube. A Hutong rickshaw trip leads you to where old Beijingers lived, passing through the narrow alleys and lines of courtyard houses. Lunch at Hutong local family, continue to appreciate panda bear in the Beijing Zoo. Be transferred to airport and fly to your next destination. 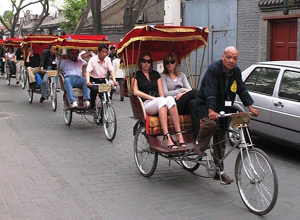 how much is the http://www.beijingshanghaitour.com/beijing-tours/beijing-package-tours/3-nights-4-days-beijing-tour-route-c/. tour for four people in spanish? we do not need hotels or airport transfers.